Christmas is one of our favorite holidays to craft for! That is why we have collected all these Christmas projects for your Silhouette and Cricut. Here are some festive Christmas projects for you to enjoy!! We just love these customized gift tags. A cohesive look under the tree always looks amazing. The tags will give you that cohesive feeling with a pop of fun! Do you need some teacher gifts? These Grinch gift packaging ideas are perfect for handing out fun gifts to teachers and friends! This sign is to die for. It is not Christmas specific, you could have it up all through winter which is nice! These tea towels from Silhouette School Blog are seriously adorable! The V with the Rudolph nose? Seriously could it be any cuter? This North Pole sign is so pretty we can’t even stand it! This would be great decor for your Christmas mantle! We love an easy stencil project. This is just that! Make these for your Christmas gift baskets. These would be perfect gifts to go with your homemade jam or chocolates for a very handmade and personal gift. We just adore this sign to hang with your mistletoe! We love glitter don’t you? This garland is perfect to make with the kids. Let them help decorate the tree or the mantle with this easy to make candy cane garland. Anytime we can make something rather than spending a boat load of cash we are IN! We love this knock off mirror for a great mantle or entryway decoration. There are so many cute tags in this post. These are great if you have a ton of gifts to give. Make a whole bunch of them and save them for next year!! This sign makes us want to snuggle up in our comfy socks with a cup of hot chocolate! 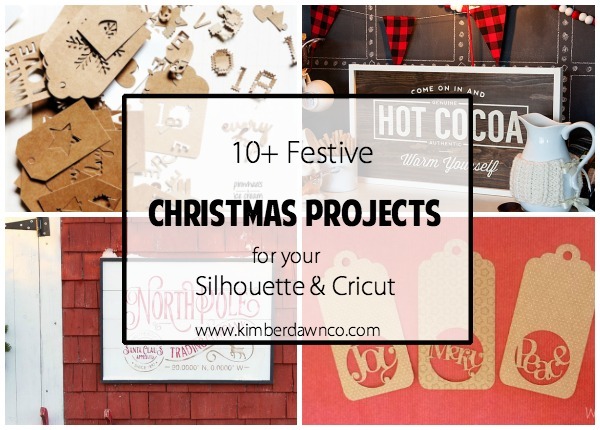 What is your favorite Christmas project for your Silhouette or Cricut? Share with us in the comments below.